As part of our series of blog posts on sustainability, we would like to introduce you to a few of our operations and present some of their key sustainability achievements. This week, learn about our Catawba (South Carolina) pulp and paper mill and view the operation’s papermaking video. 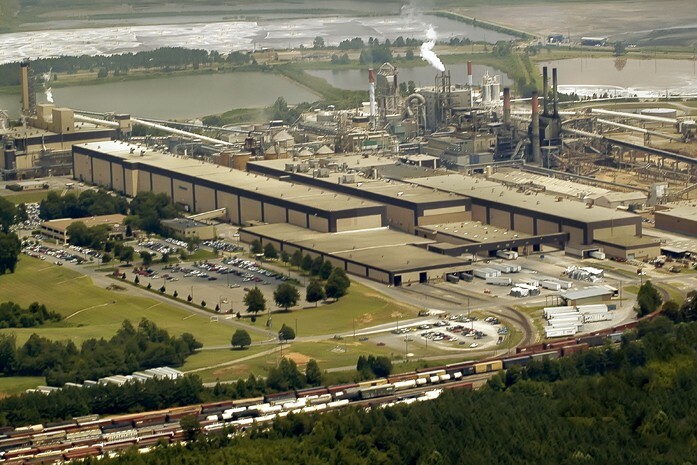 Established in 1959, Resolute’s Catawba mill, located on the Catawba River in South Carolina, is an integrated paper and market pulp manufacturing facility. It is the largest lightweight-coated paper facility in North America and one of the largest coated mechanical paper mills in the world. Paper manufactured at Catawba is used in some of the most widely circulated magazines, catalogs and retail publications in the world. The mill also produces market pulp that is sold to other paper manufacturers worldwide. The mill employs 600 and generates $426,400,000 in economic impact to the community, including $73 million in salaries and benefits. In 2011, the mill received the outstanding business “Spare the Air” award from the South Carolina Department of Health and Environmental Control for its eﬀorts to improve regional air quality. One of four U.S. mills to be part of the Environmental Protection Agency (EPA) Voluntary Advanced Technology Incentives Program. ISO 14001-certified environmental management system. Maintains direct greenhouse gas emissions below the pulp and paper industry average. Generates 42 MW of electricity onsite from carbon neutral biomass. Utilizes 9,000 tons of tire-derived fuel per year – equivalent to 750,000 tires annually. Recycles or reuses ﬂuorescent light bulbs, batteries, boiler ash, antifreeze, printer cartridges, personal computers, two-way radios, aerosol cans, corrugated boxes, small fuel cylinders, oil ﬁlters, aluminum drink cans, and used oil. Certification (PEFC) and the Forest Stewardship Council® (FSC®) Chain-of-Custody standards. Partnered with other organizations to develop and teach South Carolina’s Forestry Best Management Practices (BMPs), which set and monitor harvesting standards to ensure forest water quality is protected. Pioneered the “Bluebird Nesting Program”, aimed at increasing the dwindling population of bluebirds by distributing more than 7,000 nesting boxes in 15 states since 1974. To learn about papermaking, view the Catawba mill video. Can you tell us if any improvements are planned to reduce the smell of the paper mill in the area? Hi Pam, Thank you for getting in touch! Resolute takes environmental performance very seriously and strives to meet and exceed standards. In fact, we a very environmentally friendly pulp and paper mill and we have modern systems that collect and destroy the majority of the odorous compounds. Our operations are heavily regulated and we are committed to operating within the parameters of our permits. There are many potential sources of the odors you might be experiencing, including municipal wastewater processing facilities, municipal sewer lines, malfunctioning septic systems, and local land application of municipal wastewater treatment solids or agricultural wastes. This article from the Charlotte Observer has more information on those sources of odor. You might also find our recent blog post on beneficial waste reuse as fertilizer interesting. Please don’t hesitate to contact Resolute at eco.info@resolutefp.com if you have more questions or would like more information. Thanks!